Description: Each package contains 8 oz (227 g) of Cambrooke’s low protein Elbow Pasta. 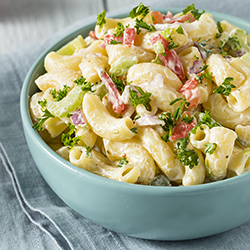 Great for making delicious cold pasta salads or casseroles. Preparation: Bring 2 quarts of water to a boil. Add a 57 g portion of pasta and simmer uncovered, stirring gently for 18 to 22 minutes or until tender. Drain and rinse well with warm water. Once cooked, you will have 126 g of pasta, just shy of 1 cup. Serving Suggestions: Serve with butter or sprinkle Cambrooke's Shake 'N' Cheese on top to make a quick mac 'n cheese dish. Ingredients: Potato starch, cornstarch, beta-carotene (color). 3/9/2010 – 1.Does this product contain any ingredient which is derived from animal source? 2.Does this product contain alcohol or alcohol . . .
3/25/2009 – Exactly how many mg of iron are in 1/4 cup cooked elbow macaroni?